Musings on Quilting, Thread and Life! Hey Quilters! Sometimes I wonder if I will ever have my schedule under control! Anyone else there too? We got back from Quilt Market and then had Angela Walters teaching at the shop for a week, which was a blast but kept me busy! And of course life always seems to have a different plan than my brain does! Last week I finally had chance to get back to my machine! The Gammill booth just so happened to be run by some friends of ours, who also sell the Bernina Q24. I was able to have a good conversation with them about how the machines compare. Pros: The overall feel of the machine was good, it was consistent and smooth. The one thing I thought was very cool about it was a mode called "Coast Regulate". Here is the direct definition from Gammill: "Coast Regulate: Control stitch length during faster movement. 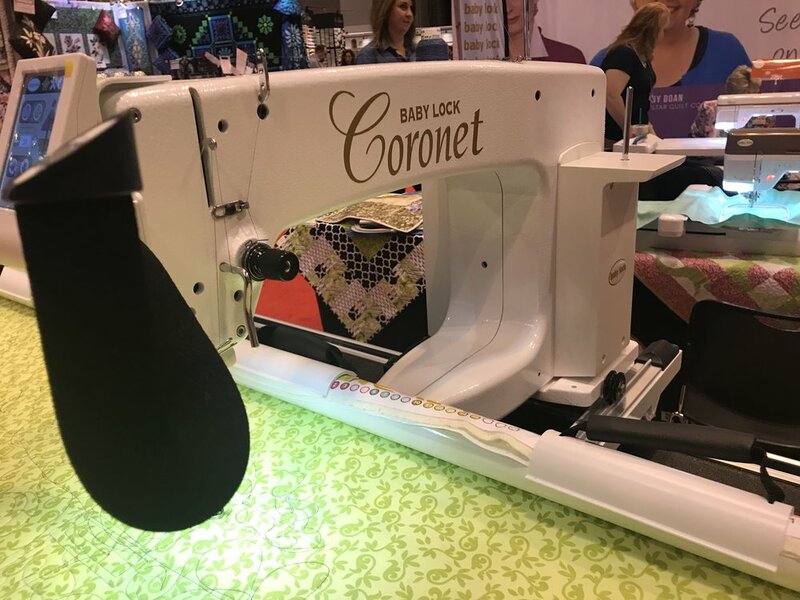 However, during fine detailed work, the machine automatically switches to constant speed to let you complete micro work with smaller stitches without stopping to change settings." Cons: The threading is more complicated than the Bernina, you start the threading all the way at the back of the machine working up to the front, which means walking around the machine halfway through threading. The Bernina is threaded from the very front of the machine making it quick and accessible. Overall the dealer I chatted with agreed that on a basic level (hand guided operation only) the Bernina was a strong competitor to the Gammill machine! The Innova has a very industrial feel, from the frame to the machine. The set up had an amazing light bar, which is an accessory you can add onto the frame. Pros: The frame felt very sturdy, there was little vibration in the handles. You can run the machine up to 3000 spm - that is some fast quilting! From the few others I talked to at Market, those who had the Innova said it was a workhorse. Cons: The handles on the machine were not adjustable, though it seems you can buy additional handles that are. The screen was a bit small and I had a hard time with their spinning "mode" icon. And of course, their machine threads starting at the back, up to the front, which we know I'm not a fan of! Overall the machine had a good feel, but for me I was a bit turned off by the "in your face" industrial look. Of course you want something that will perform, but maybe not look like it should be in a warehouse! The Grace machine were interesting, I mainly focused on their Q'nique 14 on their smaller frame (they had a demo 5' set up). This machine surprised me - at face value it doesn't look like much, and honestly looks a bit cheap. However, there were some things that impressed me. Pros: Of all the other longarms I looked at, the Q'nique was the only one where I felt no handle vibration. The 14" machine was small enough that you could reach back to thread it, and the spool rack is off to one side instead of the back. Also, this little frame was a traditional loading system, no "hooping" your quilt! Cons: The screen size is definitely not great, and the buttons on the handles have no indication of what they do, either on them or the screen. I felt like 14" was pretty small, so you would be limited to smaller projects with this set up. Apparently in all my fun I had playing at the Grace booth I forgot to take actual photos! This one shows a quick comparison between the Q'nique 14+ and the Q'nique 21! I spent some time looking at two models of the HandiQuilter, since people seem to be looking for either a small footprint machine or a full size longarm. The first was the Simply Sixteen. This set up is the Simply Sixteen on their Little Foot frame. Pros: This set up has a very small footprint, so if you are tight on space, you could probably make this set up work. HQ recommends a 6-8ft by 8-10ft space for this machine, however, the actual footprint is only 4ft by 5ft. The Little Foot frame is actually pretty solid little frame, plus it is height adjustable from 33"-44". Cons: Unlike a traditional longarm, where you load your pieces on poles - this set up requires you to pre-baste your quilt sandwich together and then "hoop" it onto the frame. Side note: While I like the ability to skip the "hooping" step with my machine, it does allow you to have a smaller machine, but still complete larger quilts - definitely something to consider for those with smaller spaces. The second model I played with was the Avante, which seems to be one of their most popular machines, plus it is the machine Angela Walters uses and we all know how much I adore her! 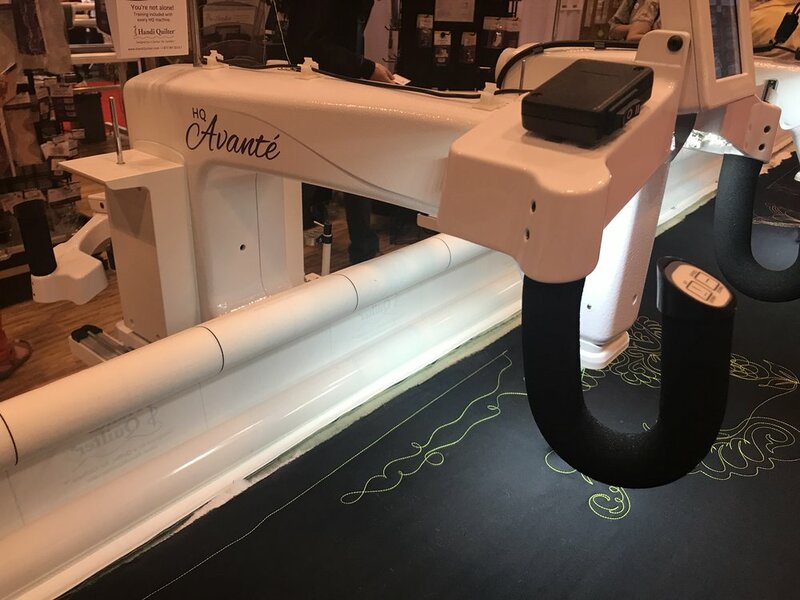 Pros: The Avante comes standard with two sets of handles/screens plus laser so if you want run a pantograph with it there are no additional purchases needed, well except for the pantograph itself! I did like the buttons on the handles, they're mostly flush, but you can feel them with your fingertip - so less chance of accidentally pushing the wrong button - if it's me, it will still probably happen but for most people maybe not! Cons: Threading.. of course, you know I'm not a huge fan of having to walk around the machine to thread it - if I had to do that on the quilt I'm working on now, I would get some extra exercising in I suppose! So, here's the thing.. I walked up to this machine the first time, no one was around and the machine was not threaded - no joke I stood there for a minute trying to figure out how to thread it myself, and then walked away. I came back the next day and it was threaded so I did get to play on it. Their set up is the Coronet is on a smaller frame, similar to the Little Foot from HandiQuilter. Pros: The small footprint is definitely a plus for those with limited space. Comes with build in stitch regulation, which is not the case with some of the other more entry level mid-arm machines. Cons: The frame had a lot of vibration, which could be felt in the handles while running the machine. This system is set up to "hoop" the quilt, so again you would have to baste your quilt together and then load it onto the frame as one pieces. Now how do you choose? WHEW!! So many choices - and of course this is not an exhaustive list of machines or even the pros/cons, this is just what I could get my hands on! Like shopping for any larger purchase my advice would ALWAYS be go try it out, use it, abuse it (not in a mean way - but make it work to be sure it will perform how you want), and ask as many questions as you can think of! Definitely think about what you will be quilting. Are you doing mostly baby quilts/art quilts (smaller items) or do you have a stack of unfinished Queen or King size quilts? And are you planning to quilt for others - this is such a loaded question isn't it?! All of these questions will impact the type of machine that will be able to meet your needs. I know for me, there is no way I could make the Little Foot frame work because I am doing mostly large quilts and as a business. I need a machine that makes loading quick, painless and doesn't have me crawling around on the floor to baste a king size quilt! Hopefully this information has helped a little bit, even maybe to narrow down choices. If you have ANY questions about machines please feel free to email me, or stop by Seams Like Home (in Anchorage, AK) to chat. By now you know I am partial to the Bernina set up, but ultimately you are the one that is going to be using the machine and you need to be happy with it. P.S: If you have one of these set ups, leave a comment and tell us what you LOVE about it!